As you can imagine, a city with a history of over 1000 years had its ups and downs. Rothenburg was involved in wars and conflicts, suffered from siege and natural disasters. Nevertheless, many of the medieval buildings survived, or were restored to their original beauty. Here is some background reading to learn about Rothenburg's history and why the medieval town could be preserved until today. In a city like Rothenburg nearly every stone "breathes" history. So it is not only interesting to look at the pretty sights, in my opinion it is even more fascinating to learn about the history of these beautiful houses. Yes, I like history! If it were possible, I would love to hear the stories of every shed in our medieval towns. Settlement in Rothenburg's area dates back to 970 AD when a parish developed in Detwang (today a suburb of Rothenburg). 1070 - The first castle at Rothenburg was built for the counts of Rothenburg in a nice spot overlooking the Tauber valley. After the counts family died off, the Hohenstaufen dynasty took possession of the castle. Around 1170 - A Staufer castle was errected close to the old castle, and the town developed. Only 2 years later Rothenburg received city rights and the first fortification was built. Markusturm, the Weiße Turm and Röderbogen are remnants of this first fortification. Actually, you'll find them within the old town now. From 1204 - First urban extension. The town fortification grew from 1400m to 2400m in length. 1250 - The foundation stone for the gothic town hall was laid. The eastern wing burnt down 1501, and was replaced by the magnificient renaissance building that has been dominating the market square until today. The white building with the elegant clock tower is still the original part of the town hall. 1274 - Rothenburg became a free imperial city which included more rights & autonomy and the city developed even more. 1311 - Construction for the mighty St. Jakobs Kirche (St. James church) started. It took more than 100 years until the monument was completed and consecrated in 1484. St. Jacob's Church features impressive religious art, including the famous wood-carved altarpiece by Tilman Riemenschneider and the Zwölfbotenaltar (Twelve Apostels Altar) with colourful paintings by Friedrich Herlin. 1356 - An earthquake destroyed both castles, the Burgtor bastion was built to protect this part of the city. Around 1400 - Rothenburg's heyday during mayor Heinrich Töppler's term of office. His home, the small Töppler castle, can still be visited in the Tauber valley. The 30 years war from 1618 to 1648 (a horrible dispute between Catholics and Protestants) caused misery & destruction in Germany, and in Rothenburg ob der Tauber as well. 1631 - General Tilly, leading a 40,000 imperial Catholic army, asked for winter quarter in Rothenburg. The city's council and senators denied the request and decided to defend Rothenburg and its Protestant belief. Rothenburg's heavy fortification could withstand a siege, however, after the gunpowder tower blew off and destroyed parts of the city wall, Rothenburg had to surrender. Tilly's troops took revenge for the 300 soldiers they had lost in the short battle. They plundered the town and left three months later. Additionally, the Black Plague depleted the population drastically, so Rothenburg fell into insignificance for over two centuries. Legend has it that the former mayor Nusch's master draught (Meistertrunk) saved Rothenburg from total destruction. This has never been proved. The lack of influence, power & wealth prevented further developments and changes for a long time, and preserved the architecture of the 16th century in Rothenburg. 1802 - Rothenburg lost its independence and became part of Bavaria. In the 19th century painters discovered the romantic town. Through their work, the historic beauty of Rothenburg became known around the world, and tourism developed slowly. Thankfully, Rothenburg's citizens and government recognised the importance of their well-preserved town. Laws prevented anyone to make changes to their houses. Modern Rothenburg developed outside the city walls. 1945 - Rothenburg was partly destroyed by an American bombing raid. The US General John McCloy was able to prevent a planned artillery attack, and the German troops stationed in Rothenburg surrendered to avoid even more destruction in the town. With international donations all destroyed buildings and the damaged parts of the fortification wall were rebuilt and feature commemorative bricks with the names of contributors. 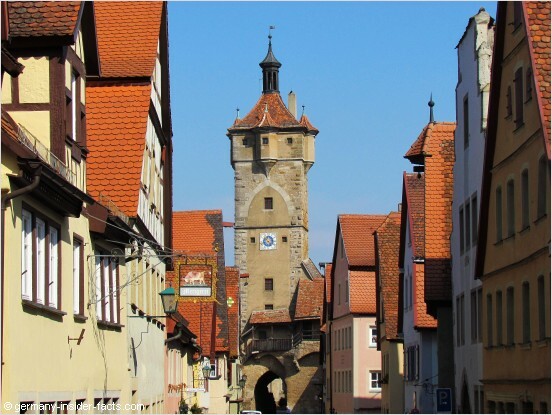 With this fascinating history, Rothenburg ob der Tauber is a beautiful place to explore. Don't miss my Rothenburg facts page with the major attractions and a photo gallery.